Devaluation is a process in which the government intentionally declares its own currency cheaper in term of foreign currency. Devaluation is a process in which the government intentionally declares its own currency cheaper in term of foreign currency. In other words, it is reduction in the external value of a currency. 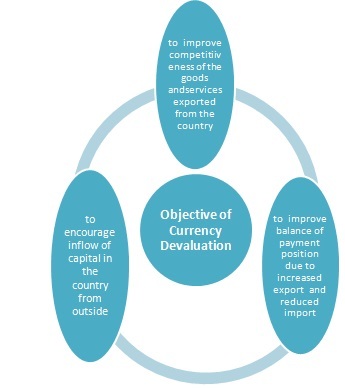 It is a monetary policy tool of countries that have a fixed exchange rate or semi-fixed exchange rate. It is often confused with depreciation, and is in contrast to revaluation. In other words, a currency is considered devalued when it loses value relative to other currencies in the foreign exchange market. A currency's devaluation is the result of a nation's monetary policy.